If life isn't hard enough for Quark without his business licence an infestation of voles has put his bar off limits and so like a good boy he goes home to mother for the love only she can give, well that's the plan anyway. As usual it's raining on Ferenginar and Ishka seems a little disturbed the Quark has just turned up and the reason soon becomes apparent as the Grand Negus and his guard are hiding in the closet. 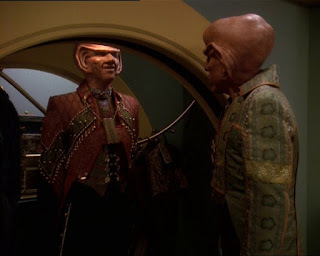 This confuses Quark who is at best paranoid but in his current mental condition he's utterly confused until it becomes clear that his mother and Zek are having an affair which is being kept quiet from the glare of Ferengi society. 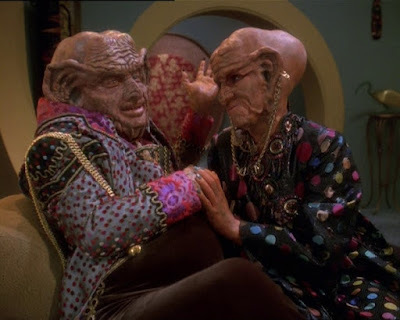 As you would expect Quark isn't totally happy about all this, he still has issues with his mother wearing clothes etc but he eventually comes around after all having Zek as a friend of the family is just good business. Zek however isn't going to return Quarks business license and Ishka agrees, Quark has to accept the consequences but much to his surprise he then finds Brunt hiding in his closet and he offers Quark a deal, disrupt the romance between Zek and Ishka and the FCA will return his license. Quark the opportunist he is wrecks the romance but then finds that Zek is having memory issues and Brunt knew about it and the fact that Ishka was helping to stabilize the Grand Nagus. The political moves are now in motion to remove Zek and make Brunt the Negas but Quark reveals his part in the plot and together they allow Zek to survive the FCA examination and retain his position. Quark then reveals to Zek his part in breaking up the romance and when he admits the truth his mother and his Nagas are reunited, Brunt allows Quark to retain his license knowing he will get a chance to destroy Quark sooner or later. The "B" plot to this episode dealt with Rom and Leeta and the interference of many of the staff of DS9, the couple broke up and then got back together with plenty of angst and misunderstandings all around. Quark is depressed, not surprising so the joy of Rom and Leeta getting married doesn't quite hit the mark, kudos for the spectacular cleavage shot of Leeta, the directors were never shy in showing off the beauty that is Chase on the show and it is in character for a dabo girl even one in a serious relationship. I also liked the idea that when Quark is at his lowest he goes home to mother even if it's chucking it down (as usual) on Ferenginar and I never really noticed how "Hobbit" like the dwellings were. It was hilarious how Quark was indignant over the missing action figures and how much later he laments his lack of foresight when taking them out of the original packaging. Meanwhile on DS9 we have fun as Rom and Leeta listen and take advice from their friends, well intended but their relationship is based on Rom moving well away from his traditional roots so an equal 50/50 marriage was never going to be their thing. That said when Rom finally figures out that Leeta is not after his meagre profits his choice to donate all of his money to the Bajoran Orphan fund and start the marriage with nothing was a grand gesture and pretty much sealed the deal. 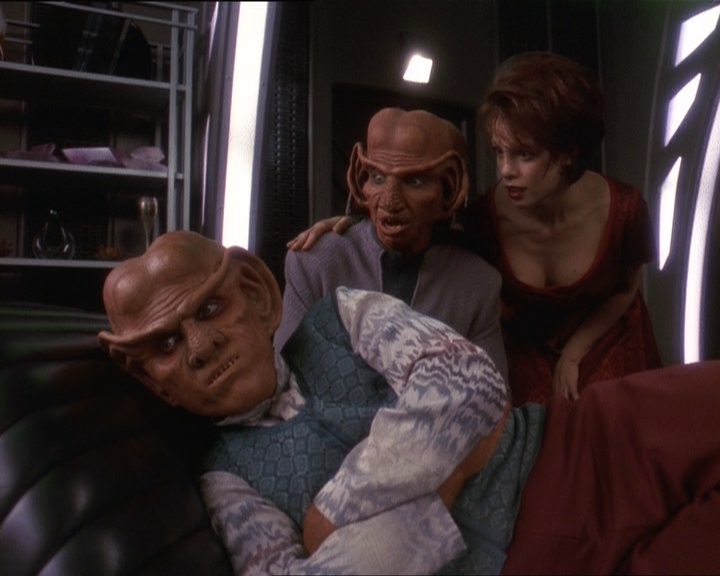 Ferengi Love Songs was a fun episode and DS9 once again proves the Ferengi are a good species when you have the right actors and good scripts. Wallace Shawn, Jeffrey Combs and Cecily Adams were all outstanding.